Pennsylvania Route 662 (PA 662) is a 26.17-mile-long (42.12 km) road located in eastern Pennsylvania. Its southern terminus is at U.S. Route 422 (US 422) in Douglassville and its northern terminus is at PA 61 in Shoemakersville. The entire route is in Berks County. The route is a two-lane undivided road its entire length and passes through rural areas. PA 662 heads north from Douglassville, intersecting PA 562 in Yellow House before becoming concurrent with PA 73 northwest through Oley. From here, PA 662 continues north and intersects PA 12 in Pricetown before passing through Fleetwood and coming to a junction with US 222 in Moselem Springs. After this, the route continues west and intersects PA 143 before reaching its terminus at PA 61. Between 1859 and 1897, the portion of road between Douglassville and Yellow House was a turnpike known as the Douglassville and Yellow House Turnpike. PA 662 was first designated by 1930 between US 422 in Douglassville and PA 562 in Amityville. In the 1930s, the route was extended north to US 122 (now PA 61) in Shoemakersville, replacing a part of PA 562 between Amityville and Yellow House. By 1966, PA 662 was realigned to its current alignment concurrent with PA 73 through Oley. PA 662 northbound in Oley Township. Farmland along PA 662 in Richmond Township. PA 662 begins at an intersection with US 422 in the community of Douglassville in Amity Township, Berks County. The road heads to the north on two-lane undivided Old Swede Road, passing residential neighborhoods to the west and industrial development to the east. The route passes more homes as it turns northwest and passes through the community of Amityville. Past Amityville, PA 662 enters more agricultural surroundings with a few residences. In Yellow House, the road crosses PA 562 and enters Oley Township, where the name of the road becomes Memorial Highway. The route heads north-northwest through farmland in the Oley Valley region before reaching an intersection with PA 73 in the community of Oley. At this point, PA 662 forms a concurrency with PA 73 by turning northwest onto that road. The two routes pass a few businesses in Oley before heading into areas of farms and woods. PA 662 splits from PA 73 by making a turn to the north. Immediately following, the route makes a left turn and enters Ruscombmanor Township. The road leaves the Oley Valley and heads northwest and then north over a wooded mountain prior to coming to the community of Pricetown. In this area, the road passes a few homes and businesses at the intersection with the eastern terminus of PA 12. Past this area, PA 662 crosses over wooded South Mountain, where there is a few homes. After crossing the mountain, the route heads north into the borough of Fleetwood, where it becomes South Richmond Street and passes through residential areas. After crossing Norfolk Southern's Reading Line, the route turns east onto West Main Street and enters the commercial downtown of Fleetwood. A short distance later, PA 662 turns north onto North Franklin Street, passing more homes. The road leaves Fleetwood for Richmond Township, at which point the name becomes Moselem Springs Road. PA 662 heads northwest through agricultural areas prior to reaching a roundabout with US 222 in the community of Moselem Springs. Following this intersection, the route heads through more farmland prior to reaching the southern terminus of PA 143. At this point, PA 662 turns west into woodland, crossing the Maiden Creek into Perry Township. Upon entering Perry Township, the road heads into farmland, making a few sharp turns to the north before heading to the west. PA 662 passes through agricultural areas with some homes before coming to its northern terminus at PA 61 in the borough of Shoemakersville. The section of PA 662 between Douglassville and Yellow House was originally known as the King's Highway. In 1859, this road became a turnpike known as the Douglassville and Yellow House Turnpike, which existed until 1897. 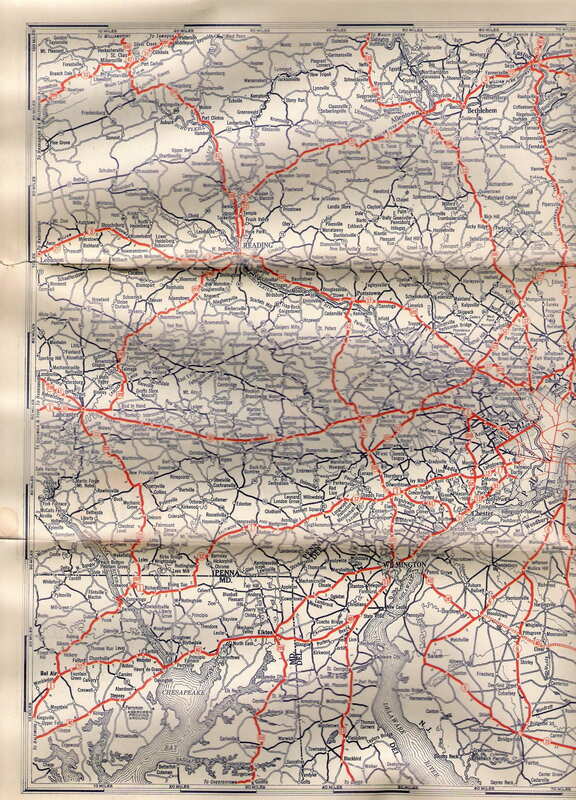 When routes were legislated in Pennsylvania in 1911, present-day PA 662 was not legislated as part of a route. By 1928, what would become PA 662 was paved between Douglassville and Yellow House, in the Oley area, and between Pricetown and Moselem Springs. PA 662 was first designated by 1930 to run from US 422 in Douglassville north to PA 562 in Amityville, while PA 562 was designated along the portion of road between Amityville and Yellow House. In the 1930s, PA 662 was extended north from Amityville to US 122 (now PA 61) in Shoemakersville. The route replaced the PA 562 designation between Amityville and Yellow House. At this time, the entire length of PA 662 was paved. By 1966, PA 662 was rerouted to its current alignment through Oley along with PA 73, having previously passed through the community along Deturk Road, Friedensburg Road, and Main Street. A roundabout was constructed at the intersection with US 222 in Richmond Township. The project, which is to cost $6.6 million, replaced the signalized intersection between the two routes with a roundabout, with US 222 widened to four lanes at the roundabout. Construction of the roundabout began on September 6, 2016. The roundabout opened to traffic on May 22, 2018, with all lanes at the roundabout opened on July 20, 2018. The entire route is in Berks County. Wikimedia Commons has media related to Pennsylvania Route 662. ^ a b c Google (2010-11-25). "overview of Pennsylvania Route 662" (Map). Google Maps. Google. Retrieved 2010-11-25. ^ a b c Berks County, Pennsylvania Highway Map (PDF) (Map). PennDOT. 2010. Archived from the original (PDF) on 2011-07-18. Retrieved 2010-11-25. ^ Transactions of the Historical Society of Berks County. 3. Historical Society of Berks County. 1923. p. 68. ^ Official Road Map of Pennsylvania (PDF) (Map). Pennsylvania Department of Highways. 1940. Archived from the original (PDF) on July 5, 2011. Retrieved June 24, 2010. ^ Davidow, Kimberly (December 5, 2012). "PennDOT looking at ways to ease congestion on Route 222". Allentown, PA: WFMZ-TV. Archived from the original on December 9, 2012. Retrieved December 7, 2012. ^ Staff (August 26, 2016). "Roundabout to replace intersection at routes 222, 662 in Berks County". The Morning Call. Allentown, PA. Retrieved September 1, 2016. ^ Herman, Holly (May 23, 2018). "A smooth first day as Route 222 roundabout opens in Richmond Township". Reading Eagle. Retrieved May 30, 2018. ^ Staff (July 19, 2018). "PennDOT set to open all lanes of Routes 222, 662 roundabout". Allentown, PA: WFMZ-TV. Retrieved July 19, 2018.